CHRIS GRABENSTEIN is the #1 New York Times bestselling author of Escape from Mr. Lemoncello’s Library, Mr. Lemoncello’s Library Olympics, The Island of Dr. Libris, the Welcome to Wonderland series, and many other books, as well as the coauthor of numerous fun and funny page-turners with James Patterson, including I Funny, House of Robots, Treasure Hunters, and Jackie Ha-Ha. Chris lives in New York City with his wife, J.J., two cats, and a dog named Fred. You can visit Chris at ChrisGrabenstein.com. 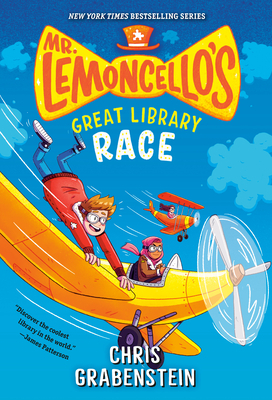 Escape from Mr. Lemoncello’s Library has been nominated to 41 lists across 37 states and is the winner of 21 state awards (and counting)!